In a world where we are surrounded by advertisements both online and off, many of us have learned to drown out the constant barrage of marketing. We automatically filter marketing emails into our promotions tab, quickly scroll past ads in our social media feeds, and barely register the endless signage that decorates bus stops and store windows. Capturing the attention of your customers requires creative, bold advertising that engages, educates or inspires. While billboard advertising can be all those things, it’s also expected (and expensive) so it’s challenging to make a lasting impact. 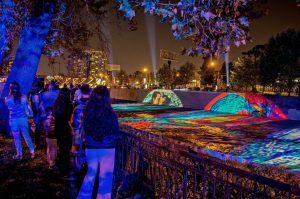 Gobo projection offers an alternative to billboard advertising that feels less like advertising and more like art. 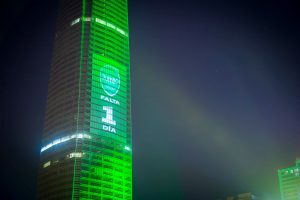 A well-placed and well-designed gobo encourages people to engage and react, making it a powerful way to increase brand awareness and reach thousands of people in multiple locations. It’s also more affordable than billboard advertising which can cost anywhere from $3K-$30K for just four weeks of exposure. 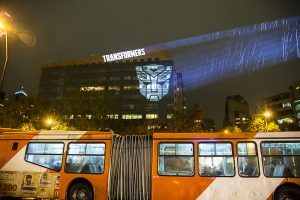 Check out these must-try alternatives to billboard advertising that will increase brand awareness and leverage the affordability and flexibility of gobo projection. With a gobo projection, you can transform an iconic landmark, building facade, or even a row of trees into a brand awareness opportunity. This type of advertising is an effective way to share a powerful message or intriguing image with a new audience. A hillside visible from a public square or main road is also an effective canvas. And don’t undervalue the impact of advertising on walkways and on the ground of busy plazas. Just be sure to research local ordinances before projecting your brand onto public space. Take the same strategies employed outdoors and bring them inside a large space with lots of foot traffic. Shopping malls, train stations, indoor markets or food courts are all good options to increase brand awareness. What is the biggest, most compelling problem your product or service solves? How can you advertise that through an image? Or maybe there’s an inspiring or thought-provoking message you want to share with as many people as possible as part of a marketing campaign. Get creative and design a gobo that will both surprise and delight your audience. We’re all getting tired of traditional advertisements so try thinking of your marketing like a creative art piece. This is a great way to leverage social media sharing–try to imagine what type of message or image people would feel compelled to share with their friends. Just make sure your logo is included somewhere so that you’re also increasing brand awareness! What’s a popular place or landmark that people pass by on their daily commute to work? Perhaps your headquarters is located above a busy sidewalk–could you project an image on the ground that would make pedestrians stop and engage with your brand? Get creative with your projection surface. People have grown accustomed to seeing traditional signage at bus stops, but what if you could project your advertisement onto the bus itself as it pulls up to the curb? Double check that you’re allowed to advertise in your chosen space and then design a custom gobo that shares your message. Advertising with projections gives you far more flexibility than a traditional billboard or smaller-scale printed signage. 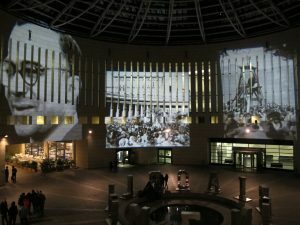 Rather than being confined to a limited timeframe and locations, gobo projections allow you to choose where your promotions appear and for how long. This is ideal when trying to increase brand awareness without draining your marketing budget. From product launches to tradeshows and corporate events, gobo projections create that element of surprise that inspires people to pay attention to your brand. There’s one more benefit to this type of marketing. Once you invest in a projector setup, you have the tools to promote your brand not just for a single campaign, but for all your campaigns, whenever and (nearly) wherever you want. The only thing missing is a custom gobo to share your message. Need help selecting the best projector and gobo for a powerful advertising campaign? 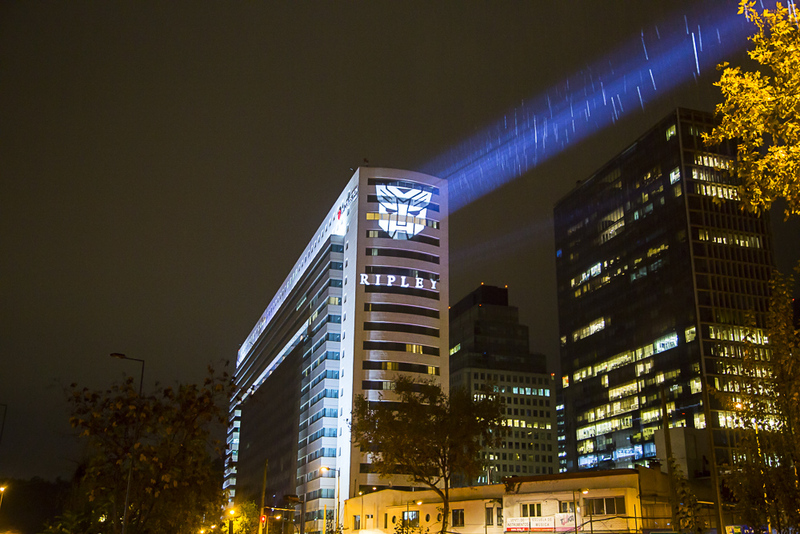 Check out our line of GOLUX projectors to create billboard-size advertisements (and larger). To ensure your messaging and/or image looks its best, select either a custom grayscale glass gobo or custom full color glass gobo. If you’re looking to create a stunning holiday light display, our GOLUX 1000 WE Large Scale Effect Bundle has everything you need to decorate a large public or private space. Still have questions? Contact our sales team for support. Posted on September 18, 2018 by gobosour. This entry was posted in Corporate, Marketing and tagged audience growth, billboard advertising, brand awareness, brand promotion, custom gobo, custom gobos, display advertising, full-color gobos, gobo, gobo projector, lighting effects, marketing strategy, marketing tools, outdoor projection, social media sharing. Bookmark the permalink.